maintenance mode. Did you know that sidedressing is one of the best ways to feed your plants once they’re in the ground and growing? Here’s the how, why, what and when of this method. Basically, sidedressing refers to the simple step of periodically adding fertilizer to the soil next to each of your plants, and then watering it in. It is a nice way of giving your plants occasional boosts before they flower or put out fruit. 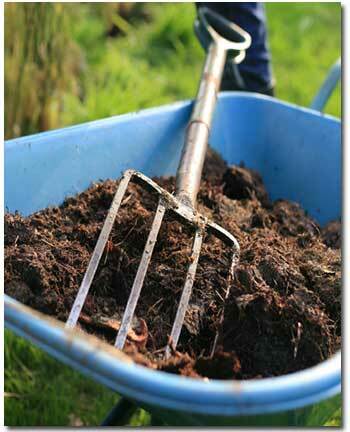 Compost is the ideal material to use for sidedressing. To sidedress, dig a trench around the plant about one inch deep and three to four inches away from the stem. Put a handful of manure or compost or two to three tablespoons of a balanced fertilizer (preferably one a little lower in nitrogen) in a band in the trench. Be careful not to sprinkle any fertilizer on the plants as it can burn them. Finish up by watering the soil, thus sending the fertilizer down to the roots. Most vegetables grown during the summer are big eaters. Squash, peppers and eggplants especially all love hearty doses of well-rotted manure or compost. The blossoms of these plants eventually become fruit, so it’s important to sidedress both at flowering time, and again just as the little fruits are forming on the plant. If you haven’t made your own compost, an excellent bloome formula is Gro Power® Flower ‘n’ Bloom 3-12-12. A great organic fertilizer for regular feeding is G&B Organics Bud & Bloome Booster. Many flowers that rank as heavy feeders and benefit from frequent sidedressing include roses, dahlias, peonies, and most annuals and tropicals.